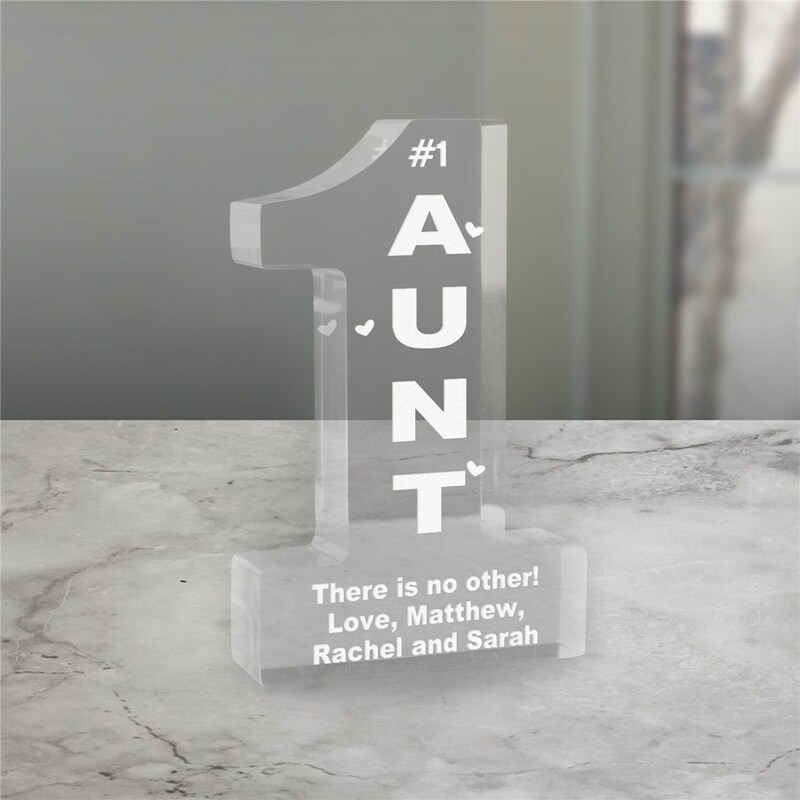 Let your favorite Aunt know she is number one in your heart with this attractively Engraved Aunt Keepsake. These Personalized Aunt Gifts make great Personalized Mother's Day Gift for Her as well. Your exquisitely clear Personalized #1 Keepsake stands 5" with edges measuring 1" thick. All Gifts for Aunts include FREE Personalization! Personalize your Aunt Keepsake with any title and up to 3 lines of custom message. very nice. the person who received it was very happy. Additional Details An Engraved Keepsake is the perfect personalized gift idea to give to that special person in your life. Your sweetheart will love this gift & cherish it for years to come. Our Engraved keepsakes make unique gifts for a bridal wedding shower. When your anniversary comes along and you need that special anniversary gift start here with our Engraved Keepsakes. A Personalized Keepsake is also great engraved gift idea for Valentine's Day, Sweetest Day, Weddings, Anniversaries or any Romantic Gift Giving Occasion. Get all your Personalized Keepsake Gifts at GiftsForYouNow.com.